Dental implants are a viable restorative dentistry option for patients who are missing one or more teeth and would like to retain the look and feel of their natural teeth without dentures. At H&M Dental & Associates, we’d love to serve as your Toronto dental implant dentist, providing you with an aesthetically pleasing alternative to missing teeth. When Toronto patients come to us in need of a dental restoration, we inform them of all potential options, highlighting dental implants as the best way to improve and maintain oral health. •	Dental implants look and function like natural teeth and replace a missing tooth without compromising neighboring teeth, unlike a dental crown. •	Similar to natural tooth roots, dental implants preserve the integrity of your jawbone. Without dental implants, bone recedes and surrounding teeth may begin to deteriorate. 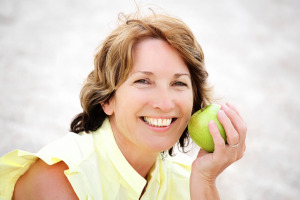 •	As we age, our gums tend to recede slightly. When the gums recede with dental bridges, others can see the metal base of your restoration. Dental implants do not have this issue. •	Because dental implants do not require cement to bond the restoration, you can avoid potential bacteria and decay in neighboring teeth. •	Dental implants are as strong and as functional as natural teeth, so you can return to eating what you like. •	Care for dental implants is a breeze. You can brush and floss, just like you would natural teeth. If you’re considering getting dental implants in Toronto, understanding what the process entails is important. The dental implant portion of the restoration refers to the titanium anchor that simulates a tooth root. This portion is surgically placed within the jawbone. During the healing phase, the implant will fuse with your jawbone, building the strength of a natural tooth root. After this implant has healed, a restoration will be fastened to it. Restorations can be made of various materials, but all will give a natural looking and functioning finish. If you’re considering a dental implant, Dr. Ghotbi will first schedule a consultation to determine whether you’re a good candidate for implants. If he determines that a dental implant is the most beneficial treatment option, Dr. Ghotbi will go over flexible payment options or will inform you of any specials you may qualify for. We will then perform 3D CT scans to map the topography of your jaw, to insure accuracy in placing the implant. Can I Be Sedated During My Dental Implant Procedure? On the day of your visit, please let us know if you’re suffering from any dental anxiety. Making sure our patients are completely comfortable is a primary concern, so we offer oral conscious sedation, as well as Nitrous Oxide to help patients be at ease. Dental implants are a trusted restorative solution. If you’re seeking dental implants in Toronto, contact us to schedule a consultation. Also, ask about implant supported dentures as a solution for patients missing multiple teeth.